What does it mean to be a man? Not just any man, but a "man's man". The way we define gender roles has changed drastically in recent years, but for me growing up around team sports being a man meant hours under a hot sun at football practice. If you dared ask for water it was a sign of weakness. If you got hurt, rub some dirt on it and keep going. 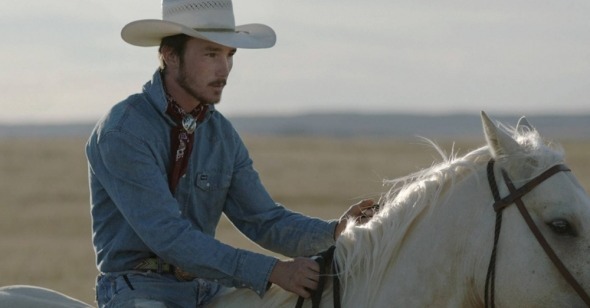 While those seem like antiquated notions now, in some places the old ways remain stubbornly the same, and it is in that hyper-masculine atmosphere that Chloe Zhao's beautiful and poignant Indie Spirit Award nominee The Rider casts its spell. A moving and sensitive look at wounded masculinity in America's heartland, the film marks Zhao's second film set in South Dakota’s Pine Ridge Reservation. Like her first, 2016's Songs My Brothers Taught Me, explores the extreme poverty in the region and how it can be intertwined with the male ego. The Rider stars Brady Jandreau in a revelatory debut performance, playing a version of himself; a young, fearless rising star of the rodeo circuit forced to give it up after a traumatic head injury sustained when a bronco bucked him off. When we first see Brady he's got a plate in his head, he moves slowly, cautiously, as if any movement might break something vital. The doctor has told him he can never ride again, not even casually on his favorite horse, Gus, with whom he shares that unique bond between man and animal. But what else is a young man like Brady supposed to do? Zhao delicately lays out Brady's dilemma, the need for sensitivity paramount since the people of this story are playing themselves. Brady's father Tim doesn't always put the family's interests before his personal demons, and can't help taking jabs at his son that usually end with "Well you can't ride anyway." His sister Lilly suffers from Asperberg's and can be a handful. In short, Brady needs to make money and if he can't do it at the rodeo what can he do? It doesn't help that all of his friends are riders, and all they and his fans want to know is when he'll get back in the saddle. No matter how many years go by some things remain constant. Our chosen career often defines how we see ourselves; work gives us confidence and self-esteem. Without it, who are we? What is our worth? Brady comments that a horse would get put down if it had suffered the same injury as him, but as a human he has to keep on living. It echoes strongly of Willy Loman's "A man is worth more dead than alive" from Death of a Salesman. And yes, Zhao's film does reach such depressing lows for a spell, but she also finds moments of clear-hearted warmth and joy. The pride Brady takes in his skills as a horse trainer, which he gets to put on display as a means of new employment. Cinematographer Joshua James Richards captures the gorgeous and intimidating wide open spaces of the grasslands, demanding this film be seen in a theater where you can take it all in. The decision to let the actors play themselves is a mixed bag, though. Brady gives a tremendous performance in what must have been a painful experience, walking through his past traumas and reopening old wounds. He isn't afforded much in the way of monologue but we understand his inner struggle through deed and action. It's a quietly simmering turn by an actor who deserves all of the accolades coming his way, even if it's the only role he was meant to play. Authenticity can be a double-edged sword. The actors surrounding Brady are credible in the sense that we know they are the real deal, but acting is a profession for a reason and not just anybody can do it. Perhaps the most astounding thing about The Rider is that Zhao presents Brady's story without an ounce of judgement or pity. As a parallel, and perhaps a glimpse into Brady's future if not careful, we are introduced to Lane. Once a hotshot rodeo star who Brady calls his "brother", Lane was paralyzed and now can't survive without constant care. Brady visits him often, showing him old rodeo videos and setting up a kid-sized saddle for him to ride, a reminder of the good old days when they were both free, wild, and galloping towards a bright future.